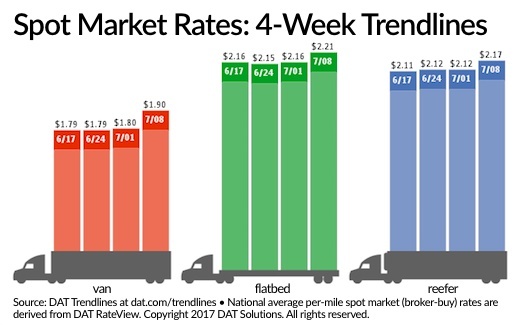 Spot truckload freight rates surged for the week ending July 8 as the number of posted loads decreased 34% and truck posts slipped 19%, according to DAT Solutions and its network of load boards. With Independence Day landing on a Tuesday, many people also took Monday off for a four-day weekend. Load posts, truck posts, and load-to-truck ratios were down for all three equipment types as a result of the shorter work week. Nationally, the number of van load posts declined 32% and truck posts were down 20% last week. That caused the van load-to-truck ratio to fall 16% to 5.4 loads per truck. Reefer load posts fell 36% after several weeks of ramp-up to the Fourth of July holiday. Truck posts were down just 9% by comparison, which pushed the national reefer load-to-truck ratio down 29% to 8.3 loads per truck. The national average spot reefer rate increased 5 cents to $2.17 per mile. Flatbed load posts fell 33% while truck posts dropped 29%.That caused the load-to-truck ratio to decline 7% to 36.3 loads per truck. The national average rate for flatbeds was $2.21 per mile last week, up 5 cents from the week before and its highest level in two years.